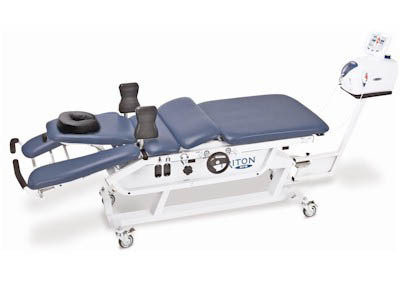 The gentle distractive forces of the Triton DTS creates decompression, the unloading due to distraction and proper positioning, to improve blood flow and important nutrient exchange to the injured area. DTS Spinal Decompression Therapy is a pain-free alternative that has shown a very high rate of success of reducing or even eliminating back and neck pain. if you suffer from chronic, debilitating, low back or neck pain, you owe it to yourself to call our office today to make an appointment to see if you're a candidate for DTS Spinal Decompression Therapy. Our office is dedicated to offering the latest, state-of-the-art therapies for treating pain in the low back and neck, sciatica, pinched nerves, and bulging or degenerative disc disease. We believe DTS Spinal Decompression Therapy to be the most advanced, non-surgical and pain free alternative.